European Commissioner Johannes Hahn paid a visit to a refugee camp in southeast Turkey on Tuesday, thanking the country for all it has done to provide for those fleeing the war in Syria. “Prosperity means jobs, means opportunities, gives people hope,” he said during a trip to the Harran refugee camp in Sanliurfa province. “That’s why I’m once again very, very grateful for what the Turkish authorities have done in the past five years. 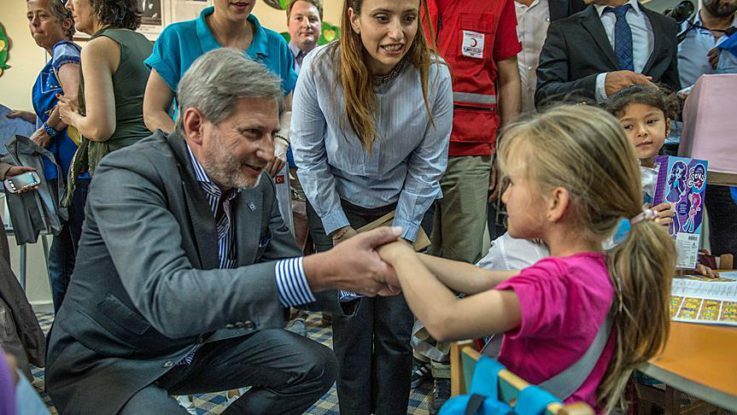 Hahn, the EU commissioner for enlargement, met officials from AFAD, the Turkish government’s Disaster and Emergency Management Authority, during a tour of the camp. After witnessing a class of Syrian children learning Turkish, he said learning the language would help refugees better integrate into society. Turkey is hosting 2.7 million Syrian refugees – the world’s largest refugee population – and last year agreed a deal with the EU to relocate Syrian refugees to the union in exchange for migrants returned to Turkey from Europe. The agreement also includes a 6 billion euro ($6.8 billion) EU aid package for Turkey.